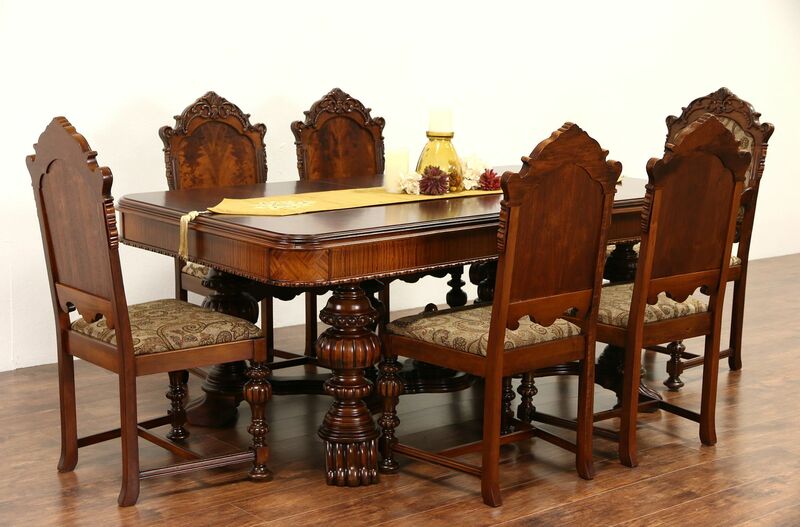 A dining set from the 1920's was lavishly carved in the Renaissance manner, and comprises a table with one leaf and six chairs. Walnut and matched burl has a superb restored finish on this American made antique furniture. The maker's signature is lost. Frames are reglued to serve another generation. The table has a spectacular glowing matched walnut burl top and imposing base. Measurements are 42" wide, 30 1/2" tall, 64" long when closed, legroom is 25" underneath, and with the 12" wide leaf in place length is 76" overall. Soft upholstery is new on the six chairs. Armchair size is 25" wide, 25" deep, 43" tall, the seat is 19" high and 17" deep, five side chairs are 22" wide, 20" deep, 42" tall and seats are 20" wide and 16" deep. The matching sideboard, server or buffet in photos is priced and sold separately, call or email for availability.